Click the links below to access our journals. Find out how you can subscribe to an RCNi journal by clicking here, or register to read daily nurse news updates for free. 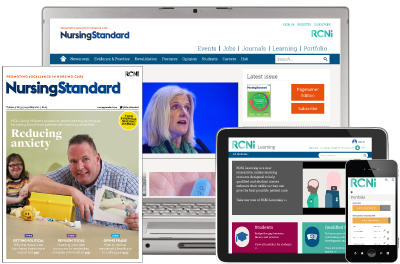 Nursing Standard offers a range of content to support nurses in delivering excellent care. It provides authoritative coverage of the latest nursing news in addition to peer-reviewed clinical content and continuing professional development (CPD) articles. Cancer Nursing Practice covers specialist topics such as cancers of the blood and breast cancer, as well as broader issues such as palliative care and oncology nursing. Emergency Nurse is the only practice-based journal in the UK written specifically for nurses providing any aspect of emergency care. Evidence Based Nursing is a one-stop resource for the latest research across all nursing specialties. It gives readers access to hundreds of pages of original research in one handy source, with expert commentaries to draw out key findings and put them into clinical context. Learning Disability Practice is written for nurses who care for people with learning, or intellectual, disabilities. Mental Health Practice provides readers with a wide range of information to develop creative and evidence-based approaches to practice. Nursing Children and Young People covers evidence-based practice in child health nursing. It promotes excellence in neonatal, infant, and young people’s care. Nursing Management provides trusted advice for senior managers, nurses in leadership roles and aspiring nurse leaders across all nursing disciplines. Nursing Older People is the leading specialist journal for nurses who care for older people across a range of health and social care settings. Nurse Researcher is the only research methodology journal written specifically for nurses and healthcare staff. Primary Health Care keeps readers at the forefront of community and primary care health nursing. Subscribe to an RCNi journal and choose 10 articles from any of our titles to read for free each month.